On Thursday, March 1, 2018, Kano and Lagos States signed a Memorandum of Understanding (MoU) for economic partnership and to jointly explore investment opportunities aimed at creating jobs and facilitating growth and development. 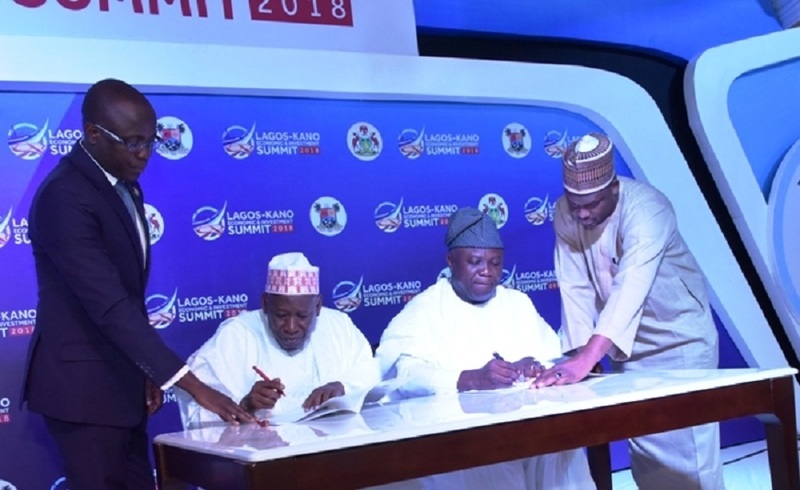 The deal was sealed by Governors Akinwunmi Ambode and Abdullahi Umar Ganduje of Lagos and Kano States respectively, at the closing ceremony of the inaugural Lagos-Kano Economic and Investment Summit held at the Jubilee Chalets, Epe. The agreement seeks to create a common platform for exploring, expanding and developing areas of economic development and Investment. While describing the summit as historic and successful, Adebule said the programme witnessed presentations from experts, erudite minds, scholars from both public and organised private sector with numerous positions expressed and outlined. She said, “In this process, our minds have been availed with torrents of ideas, information, statistics, interpretation and above all vision and collaboration leading to economic sufficiency.